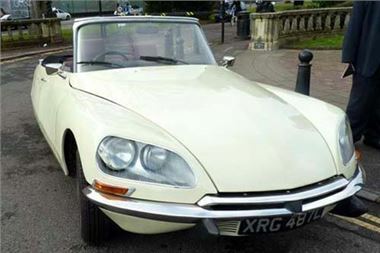 The world’s largest all-model Citroën event, is being held from 9 - 12 August 2012 at the Great Yorkshire Showground near Harrogate, North Yorkshire. The International Citroën Car Clubs Rally (ICCCR) is an annual event involving Citroens from 1919 to 2012 and is being hald for the first time in the UK sinc 1984, at Harrogate. The rally, which has been chosen byAmicaleCitroënInternationale (ACI) as their ‘Event of the Year’, runs from Thursday 9 to Sunday 12 August and welcomes Citroën vehicles from 1919 to the present day. Originating in 1973, the ICCCR was first held in the UK in 1976 and has since taken place all over Europe and the US, attracting enthusiasts from around the globe. The “not-for-profit” event is organised by and for enthusiasts of Citroën and was last held in the UK in 1984. Over 1,600 Citroën vehicles and 3,200 enthusiasts have already been confirmed for the 2012 event, with international visitors strongly represented. Many more entries are expected in the coming weeks. Citroën fans will be able to see an extensive line-up of classic Citroën models, including the most comprehensive themed display ever of British-built Citroëns and unusual British-owned Citroëns and Panhards. There will also be a selection of cars, vans and prototypes from the “Paris Conservatoire” - Citroën’s private museum collection. The organisers of the 15th ICCCR commented; “We invite everyone interested in any Citroën, from 1919 to the present day, to join us - from B2 to Belphégor, from 2CV to DS5. We expect just about every Citroën model to be present - not just cars, but vans, trucks, buses and beyond. There will also be plenty at the ICCCR 2012 to keep the whole family happy and entertained, including a firework display, live music every evening, a free heritage bus service into Harrogate, a whole host of child-friendly activities, a wide selection of food and drink options - and much more. ICCCR 2012 visitors can buy tickets and branded merchandise from the ICCCR E-Store for individual or all four days, with camping included in the ‘4-Day’ ticket price.